It deals with how to make money from stocks and much you can realistically expect to make from the markets. If you are a veteran in stock investing and have been dabbling in stocks, technical charts and indicators for years, this course is not for you. However, if you were trading hearsay without clear-cut fundamental ideas, then I would request you to buy this course. When you are investing lakhs in a course, spending a tad over rupees 700 for a definite purpose and direction and which gives your knowledge on stocks a complete makeover, is perfectly logical and doable. While reviewing this course what impressed me is the range of topics in investing that it covers. It tries to cover all the aspects the lecturer thinks you should know when dabbling in markets. His effort is honest. Let's surf through the initial chapters. It deals with how to make money from stocks and much you can realistically expect to make from the markets. As you view this chapter you will form a target on when book profits. Without this guidance, you will dither on squaring off, while the price may reverse, leaving you high and dry. Another initial chapter is devoted to better conceptualization. When you trade, you will frequently be accused of gambling. Which will make who wonder about who is right. After all, nobody wants his hard-earned money put into a gamble. Do read this chapter to pick stocks for Investing (your reason for entering the capital market) rather than those meant for trading. Stocks should neither form your whole portfolio not they should be left out entirely. A section of the lecture deals with the percentage that stocks should occupy in your total financial assets. For better results, this tutorial provides a full discussion on sample portfolio allocation. As an investor, this sample portfolio is immensely helpful. You buy a stock. I hope you are clear about what type of stock it is. If not go through the tutorial on growth, income and value stocks. You will see countless stocks whose value has decreased by 90%. I hope the stock you take does not suffer the same date. However, it will not happen because you do not want it. Go through this course and learn to analyse the risk on the security you buy. At least you will get to know what amount of fall your assets may suffer. A lecture is reserved for explaining beta and standard deviation. Unless you know beta how will rate your stock as trading or investing? Just like the stocks are categorized as per their performance, they also differ on the index and non-index stocks. Index stocks are qualitatively better. There is a chapter on MF and how to evaluate them based on their exit loads, expenses and other parameters. If you are an investor who invests more in mutual funds, go through this part of the course. Unless you have a plan in place regarding what to buy and when, the period of holding, exit plan etc. you are not likely to succeed. Haphazard investing does not warrant success. 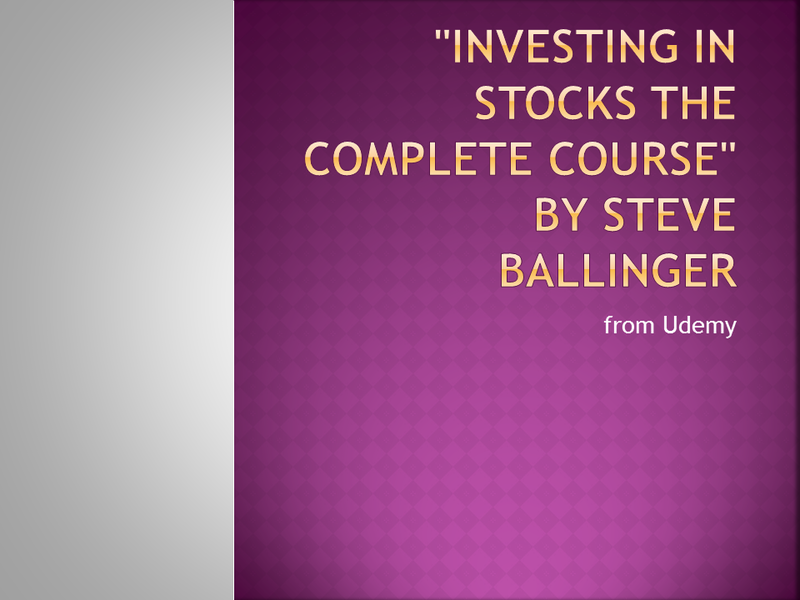 To help you strategize your investing, this course by stock market investing course, from Steve Ballinger, has a different section “stock market investing strategies”. In another section (20 lecture in all ! Wow) Ballinger tutors on how to evaluate a stock and how to decipher its financial ratios. Another section of the lecture discusses the brokers. View the lecture because the brokers are changing dynamically. View the guidance especially on the Robo traders. They are the newest kid on the block and come with their own advantage This ranges from automated trading to lower fees because of less manual intervention. Go not forget Technical analysis. All types of patterns like flags, rectangles, troubles head and shoulders are explained. Technical patterns are too important to be missed, so pay careful attention to this chapter. Trends are always your friend, ignore them at your risk. If you track them, to aid you, about half an hour is dedicated to trend lines. This course is automatically updated. When you go through the course, you will get infected by the enthusiasm of Steve. It's no surprise that most of the reviews have given him a high five-star rating. The honesty of Steve, in delivering a sterling, 360-degree course in stock investing touched me. It has helped me lift up my standard of trading. If you have been riding more on luck target than fundamentals to propel you in the stock market and wanna change that, I would heartily suggest you try this tutorial series.